In an earlier article I covered grains, feed conversion ratios in animal feed, and more. If you have not read that article, it has background information to this one. In that article I pointed out that very little of total farm land is used for things like salad fixings and vegetables. You can get an idea of those markets here. Most of the farm land goes to growing grains and legumes, and most of that goes to non-human consumption. (Historically meat production, but increasingly into gas tanks of vehicles…) So our ability to ‘feed ourselves’ is in such excess that near 40% of the U.S. corn crop goes to cars, and much of the rest is fed to cows, pigs, and chickens. Also in that animal feed is a lot of soybeans. In Europe, there is excess of cold climate grains like Rye and Barley that end up in animal feeds. (We do some of that in the USA too, but not as much). Economic data on legumes is available here. But what about the non-grain dry seeds? Are there similar choices for cold vs hot weather varieties and dry vs wet preferences? Simply put, yes. If there is any generalized shift to hotter or drier or colder or wetter, their are varieties suited to each mix. It isn’t hard to shift “at the margin” into what is better suited. Yes, it would require some changed choices, but farmers do that every year anyway. Does it all come down to grains, beans, and some common fruits and vegetables? Well, no. There are a huge number of edible plants that we don’t normally use for food crops. Green bean leaves, for example, are edible and used as a ‘pot herb’ or “mess of greens” in Africa. (I’ve tried them and they are a bit coarse textured, but tasty). The list is way too long for me to go through them all. This link gives a heading of letters of the alphabet, as you pick a letter, you get a list of the species that are food sources known to exist that we largely ignore. In any real climate challenge, all of those plants become potential major crops. So what I will be listing here is only a small part of the potential food crops, and even just a small part of the total spectrum of “legumes” or “pulses” grown. The Fabaceae or Leguminosae, commonly known as the legume, pea, or bean family, are a large and economically important family of flowering plants. The group is the third-largest land plant family, behind only the Orchidaceae and Asteraceae, with 730 genera and over 19,400 species. The largest genera are Astragalus (over 2,400 species), Acacia (over 950 species), Indigofera (around 700 species), Crotalaria (around 700 species), and Mimosa (around 500 species). Plants of this family are found throughout the world, growing in many different environments and climates. A number are important agricultural and food plants, including Glycine max (soybean), Phaseolus (beans), Pisum sativum (pea), Cicer arietinum (chickpeas), Medicago sativa (alfalfa), Arachis hypogaea (peanut), Ceratonia siliqua (carob), and Glycyrrhiza glabra (licorice). A number of species are also weedy pests in different parts of the world, including: Cytisus scoparius (broom), Ulex europaeus (gorse), Pueraria lobata (kudzu), and a number of Lupinus species. Original Image from the wiki. The yellow legume seeds of lupins, commonly called lupin beans, were popular with the Romans, who spread the plant’s cultivation throughout the Roman Empire; hence common names like lupini in Romance languages. The name ‘Lupin’ derives from the Latin word lupinus (meaning “of or belonging to a wolf”), and was given with regard to the fact that many found that the plant has a tendency to ravage the land on which it grows. The peas, which appear after the flowering period, were also said to be fit only for the consumption of wolves. Lupin beans are commonly sold in a salty solution in jars (like olives and pickles) and can be eaten with or without the skin. Lupini dishes are most commonly found in Mediterranean countries, especially in Portugal, Egypt, and Italy, and also in Brazil. In Portugal, Spain and Spanish Harlem they are popularly consumed with beer. In Lebanon, salty and chilled Lupini Beans are called “Termos” and are served pre-meal as part of an aperitif. The Andean variety of this bean is from the Andean Lupin (tarwi, L. mutabilis) and was a widespread food in the Incan Empire. The Andean Lupin and the Mediterranean L. albus (white lupin), L. angustifolius (blue lupin), and Lupinus hirsutus are also edible after soaking the seeds for some days in salted water. Lupins were also used by many Native American people such as the Yavapai people in North America. Lupins are known as altramuz in Spain and Argentina. In Portuguese the lupin beans are known as tremoços and in Antalya (Turkey) as tirmis. Edible lupins are referred to as sweet lupins because they contain smaller amounts of toxic alkaloids than the bitter lupin varieties. Newly bred variants of sweet lupins are grown extensively in Germany; they lack any bitter taste and require no soaking in salt solution. The seeds are used for different foods from vegan sausages to lupin-tofu or baking-enhancing lupin flour. Personally, I like the flowers but something in the bean bothers me. Even just smelling a package of the seeds… perhaps I’m just better at detecting the alkaloids. Beans, peas, lentils, vetch and ‘gram’ beans, and more are important for fixing nitrogen from the air into the soil. Many such drops are grown just as a ‘green manure’ to improve soil fertility. Others are grown for animal forage (clover, Austrian winter peas, and vetch). Some can be used for all of these things. Planting beans in rotation with grains is a common way to keep soil in shape and improve yields. Beans and grains also are complimentary foods, so often paired (especially in vegetarian diets). The small subset of those 19,400 species that we will look at are just the Tepary Beans, Soy Beans, Field Peas, chickpeas, lentils, “gram” beans, common beans, runner beans, peas, and fava beans. Though I may make “honorable mention” of some others along the way (such as the pigeon pea used in animal feeds in the west and common in India. They are a tropical perennial pea ‘tree’ so don’t do well in temperate regions.). That list is more or less in order from “hot and dry” to “cold and wet” adapted. Tepary beans grow in the desert southwest of the USA, while fava beans are from Europe and the middle east. Here in California they grow best in the cold and wet of winter. Beans can be eaten fresh, for some ‘in the pod’ as a vegetable, as ‘greens’, or as dried seeds. Many are used to get cooking oil and the residue fed to animals. They are a very versatile group. Most folks have never seen nor tasted a tepary bean. I grew some a couple of years. My biggest problem was having too rich a soil and too much water. They really prefer a more desert like environment and didn’t like the cold evenings near the Pacific coast. But anyone worried about too much “global warming” ought to realize these guys exist and make a great food. The namesake of both the brown and the white Tepary bean is pawi, the Papago Indian word for bean, and further, t’pawi—meaning ‘it is a bean.’ The Tepary plant is adapted to the dry conditions of the American southwest; it is drought-resistant and able to mature on a single irrigation or thunderstorm downpour. The plant also holds up well against disease. Before arriving on US soil, the Tepary bean had a rich cultural history that stretched back more than six thousand years in the arid landscape of Mexico. Both the brown and the white versions of the Tepary have a rich and nutty flavor. The beans are shelled and dried before use and are cooked into many traditional southwestern stews and casserole-like dishes as well as a ground Pinole. The Hopi Indians use the white Tepary beans to break a traditional fast by placing the beans under the hot sand and cooking them with salt water. The beans vary in color and shape; they are oval, flattish or round and vary between a fleshly white, speckled brown, reddish-brown, or purplish-brown color. For their very small size they offer an exceptional nutritional value. While these miniature beans have a quick crop yield, they are also very difficult to harvest due to their small size and thin skins, which split open upon touch, scattering the beans. I didn’t find them that hard to harvest. Yes, a bit of ‘shatter’ if left too long on the plant in dried form, but not a problem. Do realize that the Desert Southwest of the USA and Mexico is a very dry and very hot place. Phoenix, for example, reaches 120 F (about 50 C) regularly. Notice that Vicia in the name. We shifted to a very different type of bean from the “phaseolus” you will see in many others. This is not a ‘common bean’, this is a kind of ‘vetch’. Many vetch crops are just grown for animal fodder, but in this case the beans are edible. In many places the Fava Bean is called a Broad Bean. The broad bean has high plant hardiness; it can withstand rough climates, and in this case, cold ones. Unlike most legumes, the broad bean can be grown in soils with high salinity, as well as in clay soil. However, it does prefer to grow in rich loams. In much of the English-speaking world, the name “broad bean” is used for the large-seeded cultivars grown for human food, while horse bean and field bean refer to cultivars with smaller, harder seeds (more like the wild species) used for animal feed, though their stronger flavour is preferred in some human food recipes, such as falafel. The term fava bean (from the Italian fava, meaning “broad bean”) is usually used in English-speaking countries such as the US, but the term broad bean is the most common name in the UK. Some folk from the Middle East react to Fava beans and become ill. That is because they have a mutation to increase resistance to malaria via high oxidative stress in their red blood cells. As the fava bean also increases oxidative stress, having a ‘double dose’ of it is too much. (Though this does imply that eating fava beans alone for those without that gene might help with malaria…) So if of Arab or Jewish ancestry, approach with caution. So might have some medicinal uses too. 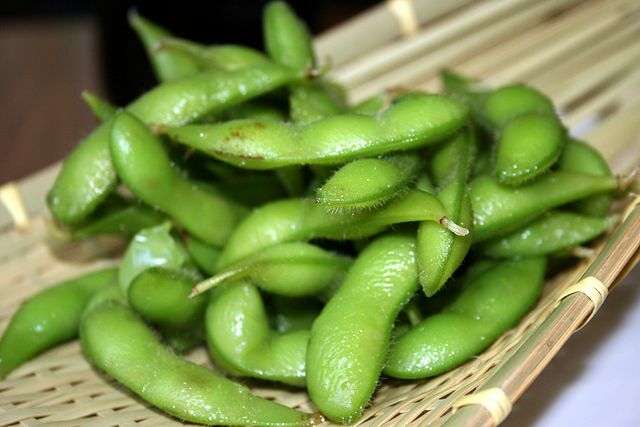 I’m one of the few Americans who likes the Edamame type that is cooked green in the pod and eaten as a snack (but our numbers are growing!) I’ve not done well in my attempts to grow soya beans. I think it may be a bit cool here for them. They seem to do quite well in the hot Southern States. Again from the wiki: “Cultivation is successful in climates with hot summers, with optimum growing conditions in mean temperatures of 20 to 30 °C (68 to 86 °F); temperatures of below 20 °C and over 40 °C (68 °F, 104 °F) retard growth significantly.” As it often is in the 50F to 70F range at night here, we are just too cool, IMHO. I’ll just mention peanuts in passing: They are a ‘bean’ too, but classed with the nuts usually. They like warmth, as in the Southern States, so often are gown in the same areas as soybeans. The term ‘Southern Field Peas’ refers to hundreds of different varieties of peas that are subdivided into four main groups: field peas, Crowder peas, cream peas and black-eyed peas. Originally brought to the US from the Niger River basin of West Africa, Field peas have been in the New World since colonial times. Field peas became a staple food among poor residents in the deep American south, as they are drought tolerant and easily adaptable to varying types of soils. The beans are eaten both as fresh shelled beans and dried, on the vine, for winter eating. Each variety offers a distinctive taste and color. Another heat loving kind of legume. Notice that we’ve shifted again to a different high level part of the name. Vigna. That genus also includes the Adzuki bean (Vigna angularis — Azuki Bean) and the mung bean (Vigna radiata — Mung Bean) often made into bean sprouts. Cowpeas are one of the most important food legume crops in the semiarid tropics covering Asia, Africa, southern Europe and Central and South America. A drought-tolerant and warm-weather crop, cowpeas are well-adapted to the drier regions of the tropics, where other food legumes do not perform well. It also has the useful ability to fix atmospheric nitrogen through its root nodules, and it grows well in poor soils with more than 85% sand and with less than 0.2% organic matter and low levels of phosphorus. In addition, it is shade tolerant, so is compatible as an intercrop with maize, millet, sorghum, sugarcane, and cotton. This makes cowpeas an important component of traditional intercropping systems, especially in the complex and elegant subsistence farming systems of the dry savannas in sub-Saharan Africa. In these systems the haulm (dried stalks) of cowpea is a valuable by-product, used as animal feed. Research in Ghana found that selecting early generations of cowpea crops to increase yield is not an effective strategy. Francis Padi from the Savannah Agricultural Research Institute in Tamale, Ghana, writing in Crop Science, suggests other methods such as bulk breeding are more efficient in developing high-yield varieties. Cowpeas are a common food item in the Southern United States, where they are often called black-eyed peas or field peas. Two subcategories of field peas are crowder peas, so called because they are crowded together in their pods, causing them to have squarish ends, and cream peas. In India, in Oriya, it is called jhudunga (ଝୁଡୁଂଗ), in Bengali, it is called barboti kolai, in Kannada, it is called Alasande, in Telugu, it is called Alasandalu (అలసందలు),Bobbarlu(బొబ్బర్లు). In Hindi, it is called lobhia or bura (when used as a string bean). In Gujarati, these are called chola or chowla (ચોળા). In Marathi, these are called chawali or chavali (चवळी). In Kārāmani, Kārāmani Payir, or Thatta Payir (Tamil) the beans, called thatta kaai, are an integral part of the cuisine in the southern region of India. So another heat adapted variety that doesn’t mind things a bit on the dry side. Notice, too, that the greens are edible. Much like “green beans” or “string beans” where we don’t bother eating the bulk of the plant; but would could if things got bad. The “yard long bean” is an Asian green bean type that makes very long pods. The Adzuki and Mung beans as also known as “red gram” and “green gram”. In India there is also a “black gram”. There are many other varieties grown for food too, but they are generally similar. Medium to small peas that are generally warmth adapted. The Asian varieties often expect more water than the African types. The chickpea (Cicer arietinum) is a legume of the family Fabaceae, subfamily Faboideae. Its seeds are high in protein. It is one of the earliest cultivated legumes: 7,500-year-old remains have been found in the Middle East. Other common names for the species include garbanzo bean, ceci bean, sanagalu, chana, hummus and Bengal gram. The plant grows to between 20–50 cm (8–20 inches) high and has small feathery leaves on either side of the stem. Chickpeas are a type of pulse, with one seedpod containing two or three peas. It has white flowers with blue, violet or pink veins. Chickpeas need a subtropical or tropical climate with more than 400 millimetres (16 in) of annual rain. They can be grown in a temperate climate but yields will be much lower. Phaseolus vulgaris – the common bean. They come a hundreds of types, from Navy Beans to Kidney Beans to Soldiers and Case Knife and Blue Lake. A generally well adapted middle of the climate range bean family. Phaseolus vulgaris, the common bean, is a herbaceous annual plant, grown worldwide for its edible beans, used both dry and green. The leaf is occasionally used as a leaf vegetable, and the straw is used for fodder. Clearly if any of that area was marginalized by getting too warm or cold, wet or dry, we have other bean types that could be growing instead. Which basically says that over about 30 C production falls off, but some varieties are more heat tolerant than others. Here we start to enter the cool region legumes. Lentil (Lens culinaris Medik.) may have been one of the first agricultural crops grown more than 8,500 years ago. Production of this cool season annual crop spread from the Near East to the Mediterranean area, Asia, Europe and finally the Western Hemisphere. It may have been introduced to the United States in the early 1900s. The crop has received little research attention to improve its yield and quality. It grows well in limited rainfall areas of the world. Lentil is a pulse (grain legume) crop. In North America much of the acreage is in eastern Washington, northern Idaho, and western Canada where drier growing season conditions prevail. It has been grown in that area since the 1930s as a rotation crop with wheat. Most of the lentil production in the United States and Canada is exported, but domestic consumption is increasing. Lentil is adapted to cool growing conditions, and the young plants are tolerant of spring frosts. This allows for early spring planting dates. Lentils have been grown extensively in the semi-arid parts of the world, where they have slightly lower yields, but good seed quality. High humidity and excessive rainfall during the season encourages vegetative growth, which prevents good yield and can reduce seed quality. Ten to twelve in. of annual rainfall will produce high yields of good quality seed. Excessive drought and/or high temperatures during the flowering and pod-fill period also reduce yields. Yield tends to run between about 1/2 ton to 1 ton / acre. This one is also a “phaseolus” but a different species. These guys like a moderately cool place. If too warm, they don’t set seed, but they don’t like it all that cold, either. They make a fairly giant sized bean, and the pods if young make a decent green bean, but quickly get a coarse texture on aging. I’ve had pods 9 inches to nearly a foot long and about an inch wide. This species has been cultivated in the high parts of Mesoamerica for many centuries. In pre-Columbian Mexico. the people of the Anahuac cultivated it extensively and ensured its distribution. Its introduction into southern Colombia (Antioquia and Nariño) and Europe (where it is known as scarlet runner bean and haricot d’Espagne) could have occurred in the seventeenth century before reaching other parts of the world. such as the Ethiopian highlands. It has been found in archaeological remains only in Mexico in Durango and Puebla. and wild only in Tamaulipas. Although archaeological information is very scarce. it could be assumed that its Mexican domestication took place in humid high zones. It likes those mountain cool type climates. A pluriannual species of great vegetative vigour with stems of several metres (only in a few modern cultivars are there shrubby forms) which emerge from a fleshy root. P. coccineus is easily distinguished by: its large seeds (the weight of 100 seeds is 80 to 170 g and 6 to 12 g for the wild form) and small, narrow, elliptical hilum; and its large influorescences (20 cm and in excess of 20 fruit-bearing stems) with scarlet, white or, more rarely, two-colour flowers. It carries out hypogeal germination, has a fleshy root which is divided and generally fusiform and which allows cotyledonary young shoots to resprout over several consecutive years. It flowers 50 days after sowing. with early varieties, or at the start of the rains, and continues to produce flowers over a long period, except in the shrubby varieties. In the majority of cases P. coccineus undergoes cross-pollination. assisted by its extrorse stigma and nectaries and through the action of bees and humming birds. Thus far, it is considered self compatible. On the Peruvian coast, dulce de pallar, a kind of Lima bean conserve, is prepared from the dry seed. The aesthetic value of the seeds has enabled them to be used in recreation activities in peasant communities. The small-seed cultivars were domesticated from a wild form, possibly in Mesoamerica and in more recent times. The seeds are eaten dry (the Mayans of today prefer them refried) or green. In Asia the young plants or young leaves are consumed; in Madagascar they are used to prepare hay. Among the reasons for the present marginalization of P. lunatus, apart from abandonment of the traditional diet with the rural exodus and changes in peasant customs, we should mention the presence of a cyanogenic glucoside which in some cultivars, if detoxification is omitted, may cause poisoning. Standardization in the consumption of leguminous vegetables (some varieties of common bean or cowpea) has been prejudicial to the Lima bean because of the presence of this glucoside. The small-seed cultivars, particularly under irrigation, suffer from the competition of soybean (and sometimes the cowpea because of its price). In the Peruvian Andes, Lima beans have heavy competition from the introduced lablab [Lablab purpureus (L.) Sweet] which is resistant to weevils, and the introduced pigeon pea [Cajanus cajan (L.) Mills], which is more tolerant of drought. Some folks just don’t like Lima beans. (I happen to love them, just salted with bread and butter…) But notice at the bottom of that quote that two unusual bean varieties are competing with it. One for drought resistance (though the Pigeon Pea needs some warmth) and one on bug resistance. Although not strict, there is a certain distribution pattern of the forms. The small-seed wild form is found from Sinaloa in Mexico to Salta in Argentina, generally below 1600 m. The small-seed cultivars frequently grow at a lower altitude in the Pacific area of Mesoamerica, from Arizona in the United States to Choco on the western range of Colombia as well as the Ecuadoran coast, and from Yucatán and Colombia to Venezuela and in the Antilles. It also exists h northeastern Brazil and in Formosa, Argentina. The larger wild form is distributed in Ecuador and in the north of Peru between 320 and 2030 m. The large-seed cultivars are distributed in Peru from 50 to 2750m and in the high valleys of Chuquisaca and Cochabamba in Bolivia. Curiously, some also exist in the south of Brazil. P. lunatus is a generally hardy species which prefers dry climates and deep soils (pH 6 to 7.2) with good drainage. Although it is true that some forms tolerate the climate of the lower tropics well, the species’ exceptional altitude range should be mentioned, particularly in Peru where some forms withstand low temperatures (Table 3). P. lunatus, both cultivated and wild, is rather heliophytic. So a plant that likes its sun, can deal with modest tropics, likes altitude too, and doesn’t mind it a bit dry. In my experience, while bean weevils like my runner beans and common beans, they don’t touch the limas… Nice to know we’ve got a bug resistant cool dry bean if needed. There are both dry peas and peas eaten wet and green. Some have edible pods. They all like cooler weather. Dry peas serve as rotational crops in the Palouse area in a state of eastern Washington and Northern Idaho. It is considered as an alternative to the cereal grain production and provides the basis to break disease cycles in winter wheat, improve soil fertility status and improve weed control. “Peas reduced the fertilizer requirements of maize by 20-32 kg/ha in India compared with wheat or fallow, respectively; in France it was estimated that about 50 kg/ha of N are returned to the soil by peas” (Davies et al., 1985). Pea growing seasons vary from 80-100 days in semi-arid regions and up to 150 days in humid and temperate areas (Davies et al., 1985). Peas are propagated only from seed. “At higher temperatures germination is rapid, but seedlings may die from various pathogens in the soil. As temperature rises during growing season, yield drops off rapidly. In New York, yields are highest when seeds are planted during first 2 weeks of April; for each 2-week delay in planting, yield of shelled peas decreased about 400 kg/ha” (Duke, 1981). Thorough preparation of soil is very important, especially when the seed is broadcast or planted with a grain drill, as no subsequent cultivation is given thereafter. In the Palouse region of eastern Washington and northern Idaho peas are sown between March 25th at lower elevations to May 10th at higher elevations when the soil temperature is above 4°C; for planting winter peas, September 15th to the 30th has been recommended (Muehlbauer et al., 1983). Recommended plant densities vary tremendously depending on soil type, cultivar, seed size, and biotic factors, particularly diseases. In the Palouse area of Washington state, USA, spring peas are sown at the rate of 140-195 kg ha-1 or 89-108 seeds m-2, while fall sown peas are planted at the rate of 85-135 kg ha-1 or 71-104 seeds m-2 (Muehlbauer et al., 1983). Yes, that’s right. 4 C for planting. Common beans just rot in the ground then. While I’d not be thrilled at giving up chili beans in a cold excursion, I think I’d happily live on spit peas soup given the alternative. My major problem with peas has been mold / mildew later in the season when warmth and humidity are too high. That’s just a small sample of the species in the Legume Family. From California desert to cold and dank mountains of Peru, you can find a legume that “works”. I think it is pretty clear that just by changing species planted in different areas, we can adapt to many / most changes of rainfall and temperature. This entry was posted in Food, Plants - Seeds - Gardening and tagged Beans, Fava, Legumes, lentils, peas, Pulses. Bookmark the permalink. The big problem is not the varieties available but having a decent idea of what the next season’s weather is going to be like so you plant the correct variety. This is one of the major problems with the Global Warming lie and a niche Joe Bastardi, Joseph D’Aleo and WeatherBell Analytics LLC are filling. Legumes are a really good idea for farmers to plant as a cover crop in the fall or in pastures. I planted white clover which shows up fall to spring and then Hop trefoil volunteers show up in the spring along with vetch. Fertilizer is darn expensive and the clovers (trefoil) are good animal fodder that fixes nitrogen for the rest of the grasses. 20% is very high protein for a hay. Coastal burmuda hay generally runs ~ 10% – 14% crude protein. The only problem with the legumes is they are sensitive to 2,4 D so it makes weed control a real PITA. Your best bet is grazing the field close and then spot spray the weed patches the animals won’t eat. (My chore this coming week) The big farmers can not be bothered so they fertilize and spray the whole field with 2,4 D.
The economist is back: We do not eat paper but FOOD. Increasing the production of paper does not increase anything. Linked on G+ and Twitter. Malthus is still wrong. Added some pictures, a couple of links, and generally checked for typos. Austrian winter pea, sometimes called “black pea” and “field pea” is a cool-season, annual legume with good, nitrogen-fixing capabilities. This, and related pea species, are native to the eastern Mediterranean and western Asia. Early introductions eventually became established as a fall-seeded crop in the southeastern states as far north and west as Oklahoma and in the coastal sections of Washington and Oregon. In modern times, Austrian winter pea has been well adapted to the Palouse areas of Washington, Idaho and Oregon. Austrian winter pea is a low-growing, viny legume which has been shown to fix over 200 pounds of nitrogen per acre per year under good conditions in Idaho. It has hollow, slender and succulent stems, 2 to 4 feet long. The foliage is pale green, and the flowers are colored, usually purple, pink or reddish. The leaf consists of one to three pairs of leaflets and terminal branched tendrils. Pods are 1.5 to 2.5 inches long with three to five round, dark-colored seeds. Seed color is commonly gray with purple or brown mottles. Seed size is fairly large with test weights of 55 to 60 pounds per bushel. Or I might just be a bit fascinated by it as I didn’t know anyone used peas as a cover crop / forage… (We pretty much do clover or vetch out here). I’ve added a link in the posting to a page on cover crops. That reference from Kansas makes your point about variability as ‘the issue’ rather directly. Not so much as year to year, but inside the year. As we’ve gone back to a more variable regime with deep loopy jet stream, I suspect a lot of young farmers may need to re-learn why things were not planted so far north in the past. (In Florida, tomatoes have moved more north along with the citrus…) IMHO not so much due to ‘getting warmer’ as due to ‘flatter jet stream an less variability’. and cold exposure will increase winter kill. Then again, that is Kansas for you. 90 F to 11 F on a drop? Why I don’t live in Kansas. Frankly, the idea of a ‘winter crop’ where it gets to 11 F that can survive ‘sub-zero temperatures of December’ is startling(!) to me. In theory that means I could grow this in the dead of winter here without any worry at all. “We don’t do below” here… While the seeds likely are not all that tasty, they are a regular peas genetically and as an ’emergency’ crop could be interesting. I never left, so how can I come back? An interesting “though experiment” shows just how far wrong Malthus and the food shortage folks can be. Take 8 billion people. It takes about one dry pound of grain / beans to feed a person for a day. So 8 billion pounds. For 365 days a year is 2,920,000,000,000 or nearly 3 Trillion pounds. Looks frightening, no? Now make that tons ( I’m using a 2000 lb ton as the metric 2200 lb then becomes a ‘conservative’ value in yields..) now we’ve got 1,460,000,000 or about 1.5 Billion Tons. Not quite as scary but still large. It is relatively easy to get a one ton / acre yield. (Many things here had 2 tons / acre and that isn’t even counting the silage or cattle feed values http://www.uwex.edu/CES/crops/cscontra.htm “break-even price needed for corn silage to match net returns from growing cash grain (e.g. if we expect 20 tons per acre,” yes, 20 tons / acre of silage… “The canning company is offering $51 per ton for sweet corn and the neighbor’s five-year average yield is about 5 tons per acre” or 5 Tons / acre of sweet corn… up to 10 tons / acre of rice has been done: http://www.naturalnews.com/039766_rice_farming_organic_agriculture_yields.html so I’m being conservative). Think about that for a minute. ZERO of Africa, Asia, Europe, South America, Australia, or Canada needed. ONLY the American “Heartland”. To feed the entire world on a (generous) vegetarian emergency ration. beans, beans for every meal. I know you mean it in jest, but it’s actually got some truth behind it. The gas moves the intestinal content along faster and the fiber absorbs more toxins (keeping them away from the intestinal wall). The end result (so to speak;-) is lower colon cancer risks. Less residency time for less toxic exposure. It is common in Texas and Mexico to soak beans overnight prior to boiling. I have experimented with black beans soaking at room temperature and at 90F in humid Houston outdoor air in a loosly covered ceramic Mexican bean pot for 48 hours and then cooking, with no change in taste or texture. But with a noted absense of gas symptoms. I plan to always cook my black beans with an extended soak from now on. These black beans are a staple of Cuban, Mexican and Central American cooking in restaurants here and in my home. I like beans a lot, too…and to avoid some volumetric consequences it is advisable soak beans in water the night before with some baking soda, and discard that water before cooking them. Speaking of beans, I love 15 bean soup. As adolfogiurfa says soak over night place in a collander and rinse well. Toss in a pot and cook with sausage (balance sodium salt with potassium salt) just before the soup is done add celery, leeks (less carbs than onions) peppers lots of spices like celery seed and turmeric and oregano and rosemary and thyme and paprika and garlic added at the very last is Bok choy (you want it nearly raw) I often cook up a pot of soup and add either spinach or bok choy to the individual serving so I do not over cook the greens. Even if you do not grow a veggie garden it is often worth it to grow your own herbs such as oregano, thyme, sage, rosemary and parsley. Fresh picked is better for you and tastes best. Also spices are more expensive than veggies in season. The big problem is winter peas are not suited for continuous use as pasture because they do not do well with trampling by livestock link Their value is more useful in using them as green manure on your fallow crop fields to fix nitrogen and then doing a spring/late fall one off grazing that pretty much kills the plants. So far my white clover has survived quite well ~ 20 years with just one sowing of seed. Your lupins or your life. Carol Deppe in Oregon has been breeding cooler weather/drysummer tolerant beans etc. She has written some good plant breeding books plus living off what you grow/raise. Her plant breeding book is text book quality without the boring bits or high price. She also sells seeds to some of the varities she has developed like popping chickpeas, long storage squash, multi-use corn. 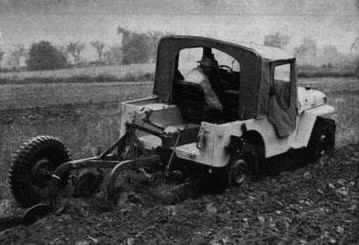 After WWII, a lot of old Jeeps were converted to use as tractors… so there’s historical precedent. Not as convenient as a real tractor as the equipment connects have to be added, but at least you can drag and plough… Or reaching way back… how about a DIY tractor? Don’t know if you can weld. (It’s not all that hard…) A decent welder is pretty cheap. (Heck, you can ‘make do’ with a half dozen car batteries and ‘stick weld’ with jumper cables…) “Junk” is usually free. Don’t need a lot of ‘body and coach’ skills. Basic frame, front steering and wheels, Engine mount on plate. Old car transmission and rear axle. Seat on a spring and some brakes. Then add hitch points. EM, I have a couple of Haflingers trained to harness but I have not hooked them yet to any of my horse drawn equipment. (I have a plow, disc and manure spreader) I also have an old lawn tractor and very small scale equipment I can use to disc, seed, drag and harrow link Since my paddocks are 40ft X 30ft so I can rotate every week, small equipment works pretty well as long as the soil is moist. It is the bushhogging rough new pasture, putting in fence posts, using a box blade to scrape the drive and spreading the aged compost that I need the bigger tractor for. My little disc can put a 1/4 inch dent in the sod for over seeding with winter rye but it can’t put in the 1 inch dent needed for winter peas unless I am real lucky with the rain. There is nothing like having a tractor and then having to do without to make you really appreciate just what modern farm equipment does for the food supply. This is especially true when you understand farmers are working against time and weather windows. If it isn’t done on time this year you are completely out of luck. In my area you put in fence posts after the fall rains (If it rains). Once summer hits the ground turns into a brick even the tractor driven auger can’t dent. @Gail Combs; I don’ t know the specifics of your pull disk. But a properly set up and weighted disk pull will cut a quarter inch in concrete and an inch in the hardest dry sod. Look at the top of the disk and you will see that the frames are inverted or at least should be. The edges are up to create an edge to hold weight, rocks, old engine blocks etc. You need about 30 lbs per foot on a light disk. Your team should have no problem with a medium weight 4foot offset disk or a 6foot light weight offset disk. or a 10 foot disk harrow. An offset disk has 2 gangs, 1 in front of the other at an adjustable angle. The greater the angle, the deeper and harder it will cut. A tillage tool. The disk harrow has 2 gangs end to end, also adjusted to cut, generally not weighted as this is not for tillage but to break clods for the seed bed. p.g.sharrow, thanks for the advice. I use cement blocks for weights until the tractor won’t move and then I back off the weight. When I am over seeding I set the disc to run in a straight line and just cut a small slit for the seed. My problem is hard baked 100% clay soil at the end of a dry 100+°F summer. It is literally as hard as a brick. There is a brick plant up the street in fact. For fall planting I am discing around Sept 1 to 15 when the temperature is just starting to come down into the high eighties and we are starting to get our fall rain. Where I have managed to built up topsoil the disc doesn’t have nearly as much trouble and the grass is four times as high. I really need that bucket loader to move my composted manure onto the spots where there is 100% clay. That is my goal this summer even if I have to dig the compost by hand, haul it by wheel barrow and spread it with a rake! The nice thing about dealing with 40ft X 300ft grass paddocks is they are not as much of a mental challenge as a whole ten acre field. I did manage to cut enough of a slit with my lawn tractor last fall that I have a nice crop of Abrussi rye this year that the critters are busy munching on. When I originally planted my pasture I found I had to disk and leave the ground real rough or the seed and fertilizer ended up in the woods. Now you would never know it started out with 6 inch trenches/hills. The rain evened the ground out within a year. My first try I used a york rake to smooth the pasture after disking. BIG MISTAKE. The first rain took all the manure, seed, lime and fertilizer straight into the woods. Sounds like you could use some gypsum to help break up the clay… spread it around and what doesn’t wash in in the rains will get disked in over time. Things loosen up then. You should read into the dangers of beans and grains to this planet and to human health. Read for instance Lierre Keith about what agriculture is doing to our lands and animals and read some writers of the paleo movement (easy for you with your neanderthal background :-) like Lorrain Cordain or Mark Sisson to learn about what soja, beans and grains do to your intestins.